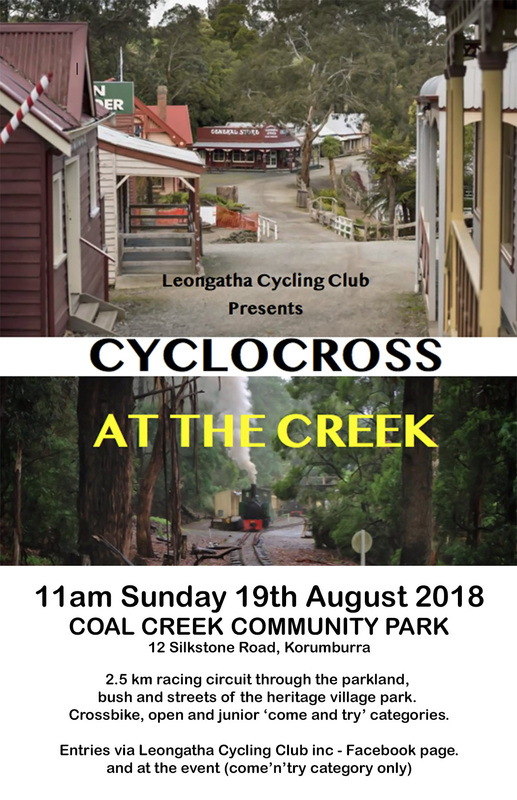 Cyclocross at Coal Creek 18th August 2018 – Leongatha Cycling Club Inc.
A & B grade riders set-off for 50mins on the Coal Creek course. 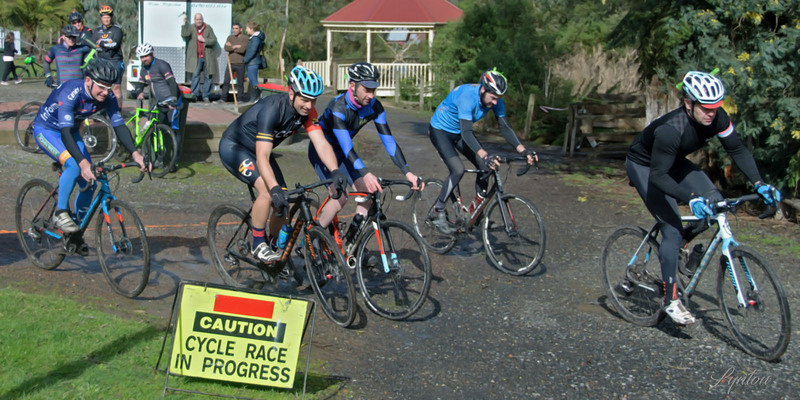 Sunday morning saw the Club stage its first ever CycloX meeting around a 2km circuit at Coal Creek. The event saw riders come from locally as well as Phillip Island and Melbourne. However, the early Sunday hail showers and cold conditions saw several entrants fail to show. Riders were split into 6 grades. The Men A&B grades raced for 50min and the winner was David McFarlane just ahead of Lachie Matthews and Eden Shields. In the C grade men’s race over 45min, the clear winner was Timothy Holmes. He would have been very competitive in the A grade field. Steve Gallyot from Phillip Island was 2nd with Wayne Foster, also from the Island just a short distance away in 3rd. The rest of the field was well spread after the 5 laps. In the Men Open section – for riders not on CycloX bikes but mountain bikes or fat tyre machines, Brett Franklin took a well-earned win just ahead of Jarred Benham whilst further adrift it was Thomas Fitzgerald edging out Damien King for 3rd. In the Women section. Alix Watson had a narrow win from Lara Srivoski, Claire Chandler and Heather Curtis in their 36min race. In the women’s open section, Bernadette Fitzgerald showed no ill effects from the Saturday race as she left all riders behind to score an easy win. Kerry Fitzgerald came home 2nd but rode the race in the company with Heather Curtis. The Club ran a kids race over a modified circuit and over just over 15 minutes. After an early fast-paced first lap by Tyler Scriven, Josh Gallyot settled into a rhythm eventually catching Tyler and going on to take a clear win. Olivia Eagle also rode good tempo and also went past Tyler and took 2nd place. Tyler came home in 3rd with Thomas King just behind in 4th. Finn Shields, the smallest rider finished in 5th whilst Blake Scriven was 6th. The Club would like to thank the Coal Creek staff for helping make the event happen and the feedback from the riders was that it was a great venue and great event. The Club will now plan for a bigger and better event next time.